This is no ordinary webinar with a pitch at the end. This is a paid workshop where I’ll take you through everything you need to know to get your site SEO and G+ Profile setup correctly. You’ll be doing the steps to your site and profile live and you’ll know why you’re doing it! There are multiple tutorials online for setting up this plugin, but few of them really cover all of the settings or tell you why you need to use them. And, all those tutorials are generic. I’ll tell you what works for different types of sites and why you’ll want to use one setting over another. Plus, I’ll show you why this plugin wipes the floor with everything else out there and how to get the most from advanced settings and why you absolutely must be using them. An SEO plugin is not enough. It can’t do everything for you. It is critically important that you coordinate your on-page SEO efforts with your plugin to get the maximum benefit. In this workshop I’ll show you both the how-to and the why-to of the six levels of SEO you need to do on every post and page and all of the hidden things Google is indexing. Google introduced AuthorRank in 2011 and it’s just now catching on for a reason and you NEED to get on the boat! I bet you’ve seen tutorials telling you how to include the rel=”author” tag on your site. There’s way more to it than that. In fact, there is a whole loop you have to close between several places on your site and your Google+ Profile, and you have to have all of it configured properly. Plus, Google has changed how they verify you as the author, so following the steps in old tutorials won’t do you any good. I’ve got the latest info to ensure that you are fully connected the way Google wants you to be. 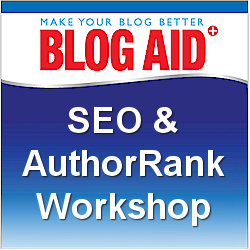 The BlogAid SEO and AuthorRank Workshop comes with bonuses too. You’ll learn the number one mistake site owners make with their XML Sitemap and how to fix it. And, you’ll get the exact code I use on BlogAid to make one of the AuthorRank connections. Plus, you’ll get super tips on rel=”publisher” which is the equivalent of AuthorRank for Brands. To ensure that your site and G+ Profile are ready for this workshop intensive, I’ve created a free Workshop Essentials series that will take you through five easy prerequisites before you register for the paid workshop. You’ll be given all of the step-by-step instructions so you can do them at your convenience. In fact, you may find that you have most, if not all, of them done already! There are two reasons this free Essentials process is necessary. First, to participate in the live workshop, you must already have a few things setup and ready to configure, like a G+ Profile and the WordPress SEO plugin installed. You only need a couple of basics configured and they’re easy. We’ll do the rest in the workshop. Second, we both want to ensure that everything is working properly on your G+ Profile and your site before you do the steps in the workshop. The Essentials process ensures that the proper foundation is laid before you spend a dime! You can start with the free Workshop Essentials right now. You could finish it quickly and then register for the SEO and AuthorRank Workshop immediately afterward. BlogAid News subscribers, VIP Clients, and Affiliates, check your email for the discount codes I sent you! Virtual seats are limited for the Workshop, and I expect this to sell out, so don’t delay. P.S. The paid workshop is available on the BlogAid Affiliate Program! It’s a great way to help your clients get the SEO info they need.